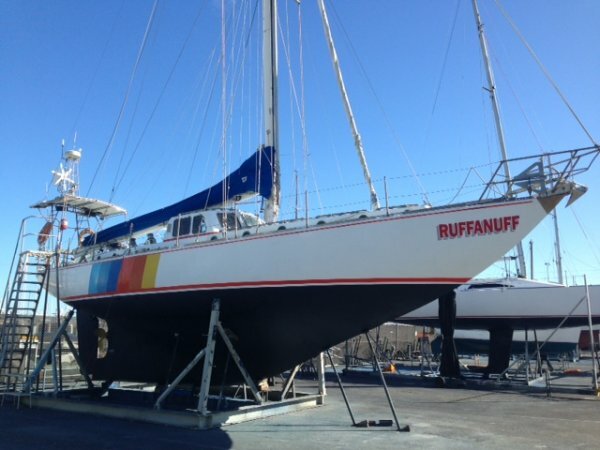 Description	Ruffanuff is a blown-up version of the famous Alan Payne designed Tasman Seabird. It was purpose -built for fast and safe cruising. Hull Built by Jack Hoffland, professional Dutch Boat Builder and current Owner Builder. Round bilge faired by highly skilled builder without using "bog"
All deck and hull fittings were drilled, tapped, fitted and then removed BEFORE painting and then re-fitted. Lee sheets fitted to all berths. Sail wardrobe	No 1 Genoa 6oz. Luff 59'4" Leach 56'4" Foot 29'6"
Luff 53'6" Leach 56'4" Foot 29' 6"
Luff 50'6" Leach 35'4" Foot 22' 2"
Luff 62' Leach 55' Foot 27'6"
Luff 71.6" Max width 37.4" Foot 35'9"
Max Luff 54'4" Foot 19'6"
Ground Tackle	3 x anchors, sea anchor, 348 feet of Chain, lies in stainless steel well, draining to aft Sump. Muir Cheetah Hydraulic, 13mm / ½ " short link chain Gypsy & Rope Capstan. Hydraulic pump, electric clutch controlled with electric solenoid direction changeover - up / down from nav-station or from switch on extension cable at the bow. WIND GENERATOR: D400 24 VDC output, "Eclectic Energy" U. K. (2014), Regulator & dump resistors, Circuit BKR. Controlled. SOLAR PANELS: 12VDC REGULATED, 2 X BP Model 350J. 50 watts each connected in parallel for 12 volt bank charge systems. 4 X BP275F Model at 75 watts each. Connected to deliver 24V batts. Charging. PROPELLOR SHAFT CRUISING GENERATOR: 24 VDC AT 65AMP Delco-Remy Alternator. Belt driven. Charges at 7 Amps regulated sailing at 6-7 knots or more. Both 12 and 24V supplies. 240 volt panels Westinghouse "Quicklag" circuit breakers. Double wound isolating transformer and cooling fans. On shore power to vessel CCTS. GPS1 : Furuno GP-31 with RD-30 remote readout in wheelhouse. Plotter: Raymarine C120 with Raystar 125 DGPS antenna. Autopilots 24 V DC	AP-7 Robertson with manual electric steering remote 50 foot cable. Operates Benmar drive unit. AP-45 Robertson with remote full function control unit. Fluxgate compass Autohelm / Raymarine ST-7000. Control panel at Nav station and remote control in wheelhouse. Remote direction pushbuttons in cockpit. AUTOPILOTS DRIVE UNIT - 24V	Benmar/Bendix Aviation Corp. USA Model #16/24VDC mechanical H/Duty gearbox chain drive output. D. C. Motor drive 3 amps/24v. Drives all 3 Pilots switched. 12 Volt DC 150 Watt PEP/RMS with Barret auto antenna tuner. Weather fax Nagra - Kudelski 1980. Switzerland. FAXDM/FAXTHF. Depth sounder Autohelm 50KHZ. ST-30 instrument readout. 1 ½ " Johnson changeover valve bilge deck wash pump. P. T. O. Perkins engine. Both 24VDC electric clutches belt driven. 1" Whale Pump Manual operated. Wheelhouse Clearview	400mm "Vista" Tokyo Japan 24VDC drive motor switched in wheelhouse. Sound System	Stereo & Radio - AM/FM. 12V. JVC/12 disc player with radio tuner. Bose environmental outdoor speakers.